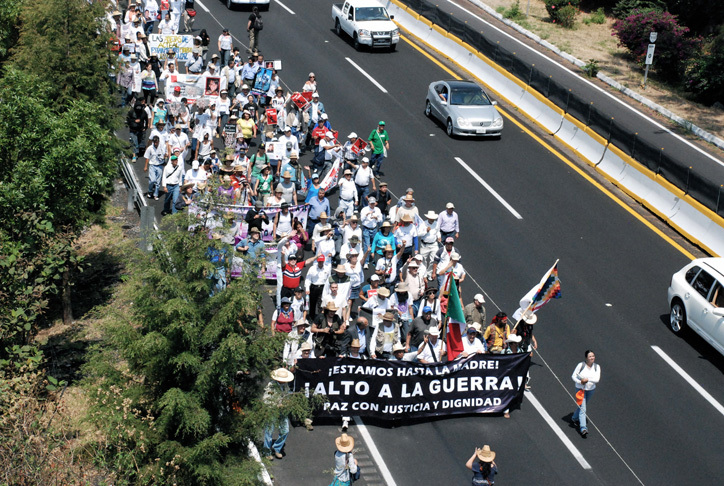 I'm in Morelos covering the "We've Had It Up to Here, Stop the War, For A Just And Peaceful Mexico" march. I will publish an article about the march when it's over at Upside Down World. But I'm so awestruck by the people I've met in the march that I have to share my initial observations with you. The march is growing by the hour. It left Cuernavaca with just over 500 people, and by the time it arrived in Coajomulco, Morelos, over a thousand people were marching. When I woke up this morning in Coajomulco, I saw that more marchers had arrived during the night, including a bus from Oaxaca that carried members of CACTUS, the community organization that Bety Cariño founded and led before she was assassinated near San Juan Copala just over a year ago. 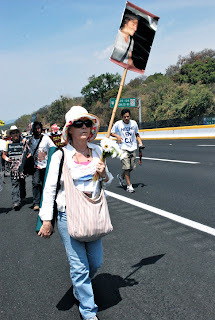 Bety's just one of Mexico's nearly 40,000 dead who are here in spirit and rage today. I don't think I will interview Javier Sicilia, the poet and journalist whose son's murder sparked this national movement against murder and impunity. He's been interviewed enough, and I am enraged that the media following the march turns off their cameras when other drug war victims speak, and they only turn them on when Sicilia speaks. It's not his fault; it's the corporate media's fault. They've made it their job to ignore the drug war's innocent victims and the families it has torn apart. When one of their own lost his son (Sicilia writes for Proceso and La Jornada), they couldn't ignore it anymore. Actually, a lot of journalists in the corporate media know Sicilia and they knew his son. They feel genuinely terrible for the man, and they've been reporting constantly from the march, step by step. Most of them even camped with us in Coajomulco. Even if I don't interview Sicilia, I do have to thank him. He's successfully removed--or at least reduced--the stigma that families feel when a loved one is murdered. * As I reported in an earlier article about the Reyes Salazar family, the drug war's victims are nameless. The government wants it that way, because it's easy to paint the drug war's dead as narcos if no one even knows their names, much less their stories. Now, however, that's changing. They're marching alongside and behind Sicilia, and the press is actually interviewing them, some of them for the first time. And they're interviewing them as human beings, not as narco-families. "Who is the young man in the photo you're carrying?" "He was my son. He was murdered. And who is the young man on your t-shirt?" "He is my son. He's disappeared." This march, more than anything, is a march against impunity. In some cases, police kidnapped and disappeared the victims. In another case, organized crime snatches little girls from a community and traffics them. In other cases, victims were killed in armed robberies. The perpetrators vary: organized crime, unorganized crime, or the government. But everyone has one complaint in common: the government has done nothing to stop the violence, and when citizens are victims of violence, the government does nothing to bring the perpetrators to justice. In a few days, you'll be able to read all about the amazing interviews I've done with some of the strongest people I've ever met. In the meantime, I want to share just one person's story with you: the Galactic Cowboy. The Galactic Cowboy's dad marches. The Galactic Cowboy's family is from Mexico State, but up until a year ago he lived and worked in Monterrey, Nuevo Leon. He is a street performer, a human silver statue of a cowboy. He stands perfectly still until you insert a coin in his box, and then he makes robotic movements. "Ever since he was little, he wanted to be a cowboy," says his father. The Galactic Cowboy works in the informal market. 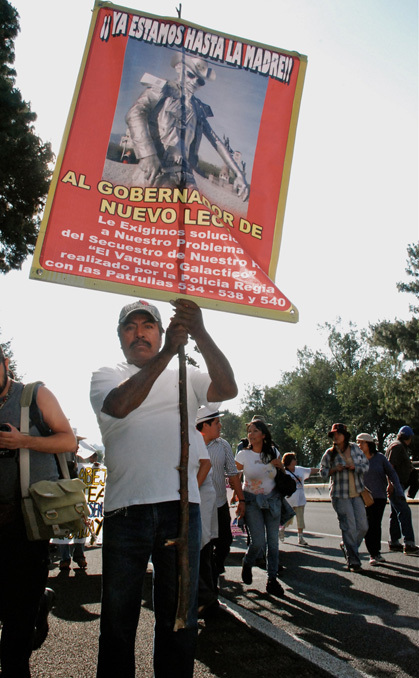 Police had detained him several times in Monterrey for working without a permit. One time he managed to get a permit to work on the street, but it was only for one month. "What good is a one-month permit?" asks his dad. Street theater is is a life-long career for the Galactic Cowboy. One day, Monterrey municipal police detained the Galactic Cowboy and two companions in Monterrey. Witnesses saw police arrest them. They wrote down the patrol car numbers. The police deny that they detained the Galactic Cowboy and his companions. The witnesses who saw them detain him refuse to testify for fear of reprisal. The government refuses to investigate the disappearance. The Galactic Cowboy has been missing for a year. * This sentence originally read: "He's single-handedly removed (or at least greatly diminished) the stigma that families feel when a loved one is murdered." Thanks to a reader comment, I changed the sentence, which I admittedly wrote in a hurry, in the heat of the moment, as I followed the march. I want to explain why I wrote this: he's been more successful than anyone else in removing the stigma victims' families feel. Other families have "thrown down" as the smart reader pointed out. And he's right. Actually, families like the LeBarons and the Reyes Salazar took MUCH greater risks than Sicilia, because they were up against much worse odds: their state and towns are more dangerous, they don't have media support, they don't have thousands of people marching with them. In short, what they are doing was a much bigger risk. Interviewing them...I'm amazed at their strength. I love Mexico.